Jazz drummer Ferit Odman's third album, "Dameronia With Strings" is a tribute to Tadd Dameron and is now available on the high resolution audiophile format developed by JVC called XRCD. The remarkably sensitive played session by Ferit Odman, Terell Stafford, Peter Washington and Danny Grissett both as a band and ace soloists lets us dream up high above the sky together with a well-balanced, swinging string sextet and beautiful arrangements by David O'Rourke. This is a tribute to Tadd Dameron and gives us the chance to remember Dameron's influential approach to jazz as an orchestrator too. 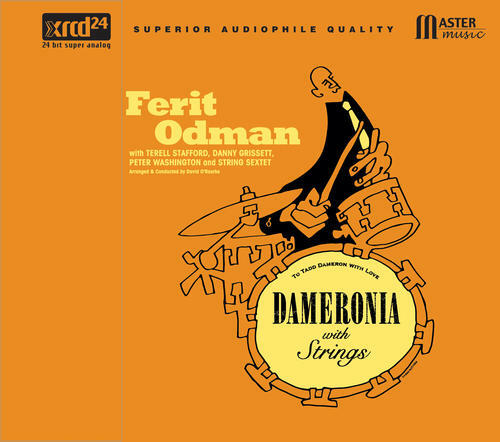 Just like Philly Joe Jones did with his Dameronia project, Odman takes us on a beautiful journey around the fantastic music composed by Tadd Dameron, this time with the addition of strings on an audiophile all analog recording. This extended resolution CD (XRCD) from JVC brings the listener higher fidelity and improved audio quality by enhancing the process of mastering and manufacturing compact discs. This XRCD is compatible with all CD players. Listen & Compare. The cover art and design was done by Japanese artist Takao Fujioka.